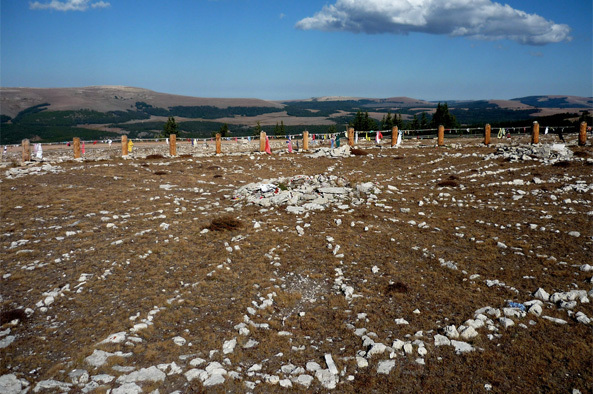 The Medicine Wheel is an 80-foot-diameter circle of stones located in the Bighorn National Forest on the western peak of Medicine Mountain, in north central Wyoming. Twenty-eight radial rows of rocks extend from a center point to the outer rim of the wheel. Many stone circles can be found throughout the western United States and Canada, but the Bighorn Medicine Wheel is possibly the best preserved of all such sites. For many traditional Indian people, the Medicine Wheel is considered to be the altar for Medicine Mountain, a site of great spiritual significance. Located at an elevation of 9,642 feet, the area surrounding the Medicine Wheel contains various alignments of rocks, tipi rings, caves and travois trails (parallel pairs of ruts in the ground caused by poles dragged by animals to carry freight). Archeological evidence indicates that the area has been used by Indian tribes for over 7,000 years. In 2001, members of 70 tribes held ceremonies at this site. The mountain is particularly sacred to Plains Indian tribes, including the Arapaho, Cheyenne, Crow, Lakota, Dakota, Shoshone, Cree, Salish, Kootenai and Blackfeet. In 1970, the Medicine Wheel was designated a National Historic Landmark by the U.S. secretary of the interior because of its archeological value. Despite much evidence of a long history of ceremonial use of the site by Native Americans, however, the Forest Service largely ignored the sacred aspects of the mountain throughout most of the 20th century. In 1988, the Forest Service proposed a viewing platform at the wheel, upgrading of the nearby dirt road and parking lot, and the construction of a visitor’s center in the vicinity. This prompted the formation of two Native American tribal organizations which, along with other environmental and historic-preservation groups, launched a successful effort to block this proposal and to have the area recognized as an important Native American religious site and managed in a manner that would protect its integrity as a sacred site and nationally important traditional cultural property. This effort culminated in September 1996, when the Forest Service, State Historic Preservation Office, Bighorn County Commissioners, Advisory Council on Historic Preservation, Medicine Wheel Coalition, Medicine Wheel Alliance and Federal Aviation Administration signed a Programmatic Agreement implementing an Historic Preservation Plan for the area. This document established an 18,000-acre “area of consultation”encompassing all of Medicine Mountain and the cultural resources associated with the Medicine Wheel, with special emphasis on protecting its sacred values. The plan facilitates traditional cultural use by Indian practitioners by providing for unlimited ceremonial use, including privacy for such ceremonies when requested, and by allowing plant gathering for religious activities. Native American interpreters are present at the site during the tourist season. Vehicular access and resource development are restricted in the area (with limited exceptions). Other activities such as grazing and tourism are permitted but carefully managed and monitored. Except for disabled persons, visitors must now hike a mile and a half to visit the Medicine Wheel. Although great progress has been made, the struggle to protect the Bighorn Medicine Wheel and Medicine Mountain continues. Wyoming Sawmills of Sheridan, Wyo. filed an appeal of the Forest Service plan shortly after its approval, but Forest Service officials denied the appeal in 1997. At the heart of the issue was the 18,000-acre area and the contention by Native Americans who use the Medicine Wheel in their ceremonies that nearby logging activities would interfere with their religious practices if heavy machinery, chainsaws and logging trucks were audible and visible from the site. Wyoming Sawmills claimed financial injury would result if they were unable to cut nearby timber and use local roads. Sawmill officials sought help from the Mountain States Legal Foundation, the same property-rights advocacy group that fought a National Park Service effort to limit climbing on Devils Tower in northeastern Wyoming because of Native American religious concerns. In December 2001, federal judge Alan Johnson ruled in favor of the Forest Service and Medicine Wheel Coalition, which had intervened in the case. Johnson ruled that Wyoming Sawmills had no standing to challenge the plan based upon the First Amendment or applicable environmental laws. He also ruled that a claim could be filed based on two other federal statutes, one specifically pertaining to the Forest Service’s management of its lands, but found that the process by which the Historic Preservation Plan was developed did not violate either law. Wyoming Sawmills and Mountain States Legal Foundation appealed the court’s decision to the 10th Circuit Court of Appeals, which, in September 2004, upheld the district court judgment, affirming the constitutionality of the Forest Service’s decision to protect the ability of Native communities to use Medicine Wheel as a site of living sacred significance. Efforts are currently under way to update Medicine Wheel’s National Historic Landmark listing, including changing the name to “Medicine Wheel/Medicine Mountain”; revising the property’s inclusion criteria and expanding its significance to include “Native American traditional cultural values that are integral to indigenous spirituality in the Northwest Plains”; and increasing the boundary area to reflect “the recognition that the Bighorn Medicine Wheel was constructed in this precise location because of the importance of the mountain summit and its associated lands.” The Landmarks Committee of the National Park System Advisory Board is due to consider this update in November 2010. The successful progress that has been made to preserve the Medicine Wheel and Medicine Mountain was initiated and guided by an organized intertribal movement led by the Medicine Wheel Alliance and the Medicine Wheel Coalition. Both groups organized early, articulated the importance of the site, used existing laws effectively, and focused on achievable goals. The groups’ activism and support helped the Forest Service to overcome initial local resistance and develop and implement an effective Historic Preservation Plan with the widespread support of federal, state, local and tribal governments. Though it was a rough and contentious road, this process proved the importance of dialogue between federal land managers and traditional Native American religious practitioners in developing policy to protect sacred areas. Chapman, Fred. “The Bighorn Medicine Wheel 1988-1999.” Cultural Resource Management No. 3, 1999. Gulliford, Andrew. Sacred Objects and Sacred Places: Preserving Tribal Traditions. University of Colorado Press, 2000. Levendosky, Charles. “Seeking To Chainsaw the Medicine Wheel Historic Preservation Plan.” Casper Star-Tribune, April 18, 1999. National Historic Landmark Nomination; Medicine Wheel/Medicine Mountain. U.S. Department of the Interior, National Parks Service, 2010. National Parks Service. “Medicine Wheel.” National Historic Landmarks Program. U.S. Court of Appeals, 10th Circuit. Wyoming Sawmills Incorporated v. United States Forest Service. September 20, 2004.